Three men sit in a radio studio, surrounded by screens streaming 24-hour news coverage of some civic unrest. The host (Wayne Best) takes a call from a member of the public (Emilio Vieira), who sounds off about the controversial leader Caius Marcus (later named Coriolanus). Studio guest Menenius (Tom McCamus), a smooth politico, spins a metaphor about the body politic, as another guest (E.B. Smith) pitches in. Shakespeare, it goes without saying, did not set Act 1, Scene 1 of his late tragedy Coriolanus in this context. But director Robert Lepage’s revisioning brilliantly brings the scene into the present, thanks to skilfully layered scenic, projection, and sound design; and the actors’ ownership of language, including ironic timing of pauses and overlaps. Not everything in the show works as well as this opening scene; as is typical of a Lepage premiere, aspects of its wild technical and technological ambition are still coming into focus, and some of the actors have yet to settle into their characters. All theatrical experiences depend on what the spectator brings to them, and this seems particularly true here. Those who’ve never seen a Lepage production and find Shakespeare a bit musty will probably have the backs of their heads blown off by this show – and as such it’ll do great work in opening up Stratford fare to new audiences (as is The Rocky Horror Show, also playing in repertory at the Avon Theatre). Rarely has Lepage’s reputation as a cinematic theatremaker been more earned: The action moves cleanly between locations thanks to textual cuts and edits, and the world-class design and production team delivers effects that should be impossible in a stage context (how to show action moving between two offices? Move the offices, in a stage simulation of a filmic tracking shot). Those who know Lepage’s earlier work will find some of the production familiar. 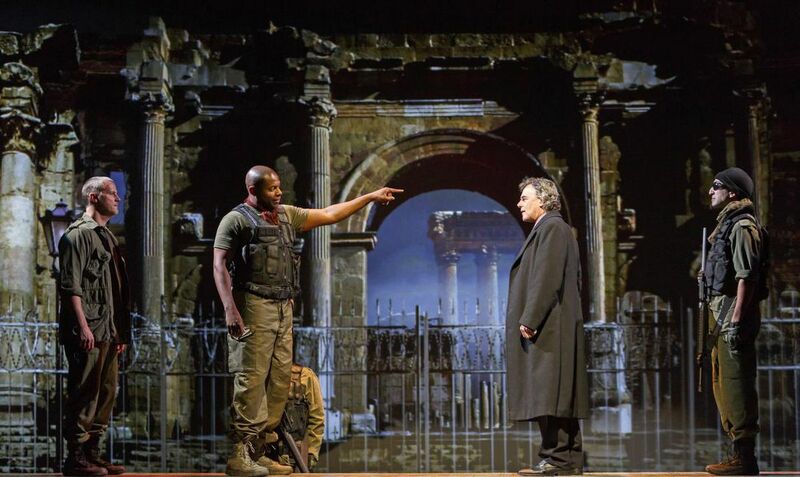 He’s continually repurposing and refining material; numerous aspects of this production are updated from his early 1990s staging of this play in French as Coriolan. The play itself has long intrigued scholars and other writers because its portrayal of emerging democratic politics is so open to interpretation (T.S. Eliot, Bertolt Brecht, and Günter Grass all wrote adaptations of it). Lepage says he is drawn to the play because Coriolanus’s disdain for the Roman public, which has historically made the character be read as an anti-hero, seems more sympathetic in the context of social media pile-ons and groupthink. Shakespeare aficionados will have stuff to grouse about: the text sometimes takes a back seat to the next jaw-dropping image. Lepage has edited heavily (particularly in the first half), with the knock-on result that it takes a while for Coriolanus to emerge as a character. He’s the focus of early scenes but mostly in absentia, as others celebrate, obsess about, and plot against his military genius. Perhaps this is part of Lepage’s point – he’s critiquing the media construction of greatness — but it limits engagement with a character whose internal struggles and political flip-flopping become the focus of the evening’s heavy second half. Sills plays so much anger and aggression throughout that it’s difficult to access other notes in his performance. Lepage is more noted for his visuals than for his detailed work with actors; the performers who offer the strongest performances are Stratford veterans calling on existing technique and experience. Lucy Peacock goes for broke as Coriolanus’s mother Volumnia, earning some of the evening’s best laughs for her voracious pursuit of his interests. McCamus is at his silken best as Menenius, Coriolanus’s friend and advocate, and Stephen Ouimette and Tom Rooney hold a lot of the action together through their dead-on double act as the scheming tribunes Brutus and Velutus. Other than Volumnia, it’s a punishing play for women (Coriolanus calls his wife “my gracious silence”), but Alexis Gordon, Brigit Wilson, and Martha Farrell fashion strong moments out of limited opportunities. Throughout the play Rome is at war with the Volscians, and this production picks up on textual cues of mutual admiration between Coriolanus and the Volscian general Aufidius (Graham Abbey) by portraying Aufidius as a gay man who is involved with his Lieutenant (Johnathan Sousa) and bowled over by Coriolanus’s mid-play defection to his camp. Considerable energy circulates between Sills and Abbey as they enact a physical staging sequence different from anything else in the production, but it is not clear how Coriolanus is experiencing the exchange; perhaps this will come clearer as the multi-month run continues. But to every interpretive question the production replies back with unforgettable images that frequently play with expected perspective: a nighttime scene on an airstrip, as Laurent Routhier’s lighting and a wind machine create the impression of a plane coming into land; Coriolanus’s crew reacting to updates on battlefield action from on unseen TV in a chi-chi bar (which paradoxically counts for “a public place in Rome” in Lepage’s reading of the play); Aufidius and the Lieutenant framed melancholically in a projected window. One aspect of the design that feels overly heavy is Antoine Bédard’s sound: while miking allows actors to play some scenes very intimately and still be heard, it seems unnecessary to alter the sound in every scene, as amplification and reverb add another level of challenge to the comprehension of already dense language. At this point in his career, Lepage rarely does one-offs: this production, created in collaboration with his own Ex Machina company, will be restaged in French at Montreal’s Théâtre du Nouveau Monde next February. Stratford made it happen, and thousands of spectators from Ontario and beyond will now get their first taste of Lepage’s special brand of stage magic. By William Shakespeare, directed by Robert Lepage. Until October 20 at the Avon Theatre, 99 Downie St., Stratford. Stratfordfestival.ca and 1-800-567-1600.